French painter (1841-1919). Autograph letter signed. Paris. 8vo. 1 page. 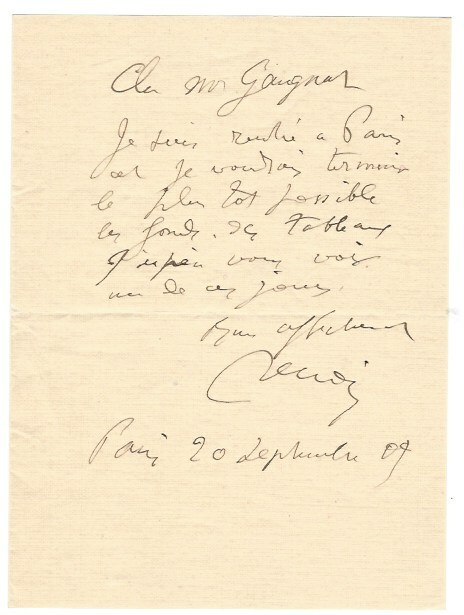 Letter to his friend art collector Maurice Gaugnat: „I have returned to Paris and I would like to finish the backgrounds of the paintings as soon as possible. I hope to see you one of these days.“ In fine condition. A crisply-penned letter with desirable art-related content. French artist (1841-1919). Autograph letter signed. n.p. [Paris]. 8vo. 1 p. Measures 280 : 134 mm and is professionally mounted and framed with a reproduction of "The Skiff (La Yole" (1875) to a total of 360x585mm. 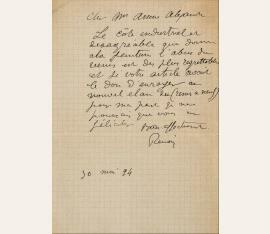 To the art-collector Arsene Alexandre, criticizing the tendency to over-varnish paintings. Renoir’s distaste was probably provoked by the great disparity between this method and his own painting style of layering small multi-coloured strokes that illuminated the luminosity of a woman's skin or the sparkle of foliage. In full (translated): „The industrial and disagreeable look which the miss-use of varnish gives to paintings is extremely regrettable and if your article could put a stop to this new rush to 'do up like new' I myself could only congratulate you. Your affectionate, Renoir“. French painter (1841-1919). 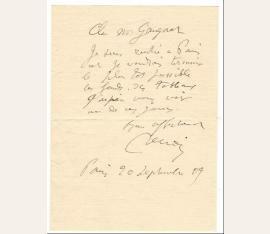 Autograph letter signed ("Renoir"). 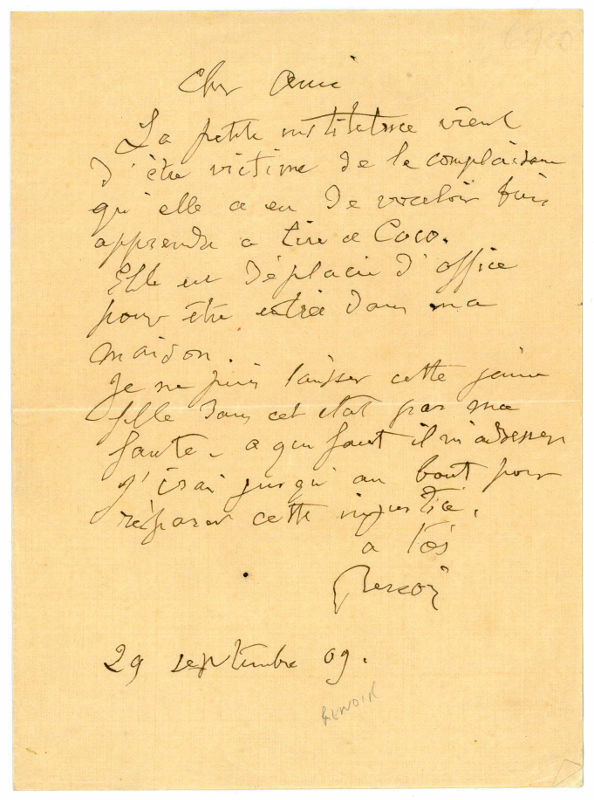 N. p. 8vo. 1 page. 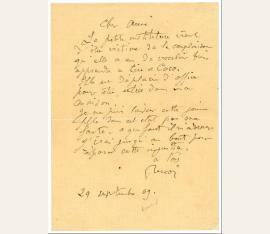 To a "Cher Ami", in French, expressing his distress that the young girl teaching "Coco" (his youngest child Claude) to read should be upset, and asking whom he should address to repair this injustice ("Je ne puis laisser cette jeune fille dans cet etat par ma faute [...] j'irai jusqu'au bout pour réparer cette injustice"). Pierre-Auguste Renoir (1841-1919), French painter. Autograph letter signed. 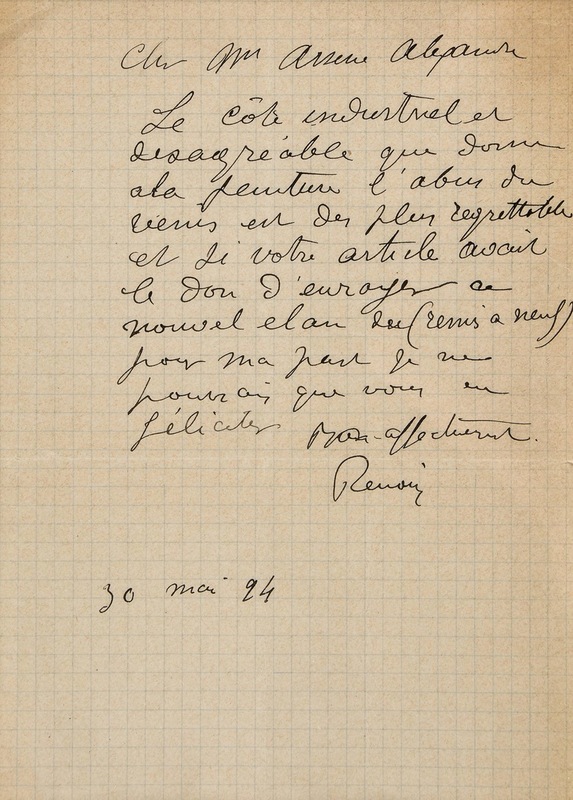 Paris, June 27, 1916. Small 8°. 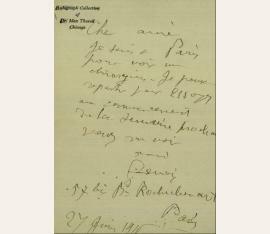 1 p. – To a friend; and by reason of rheumatism written in shaky handwriting: „Je suis à Paris pour voir un chirurgien. Je pense repartir pour Essoyes au commencement de la semaine prochaine [...]“. – Upper left margin with collector’s stamp „Dr. Max Thorak“.